Radial 2-4-2's like the one above and left, would have been a common site in Mirfield. They were introduced from the late 1800's. Eventually 330 in total were produced. The L&Y R had a reputation of being somewhat spend thrift and some of their stock were already virtually museum pieces at the formation of the L.M.S. Lancashire & Yorkshire Railway 2-4-2 passing over Newgate bridge. 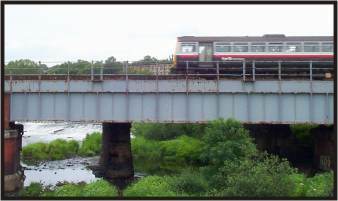 The bridge in the present view was built alongside the original stone viaduct in 1930 when the number of tracks were increased to two up and two down workings. 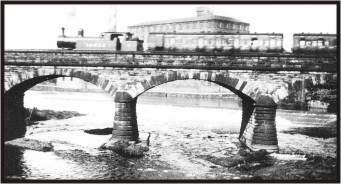 The original viaduct is still fully visable on Newgate when approaching Ledgard bridge. The map below shows the local rail network prior to the formation of the London Midland & Scottish Railway in 1948. 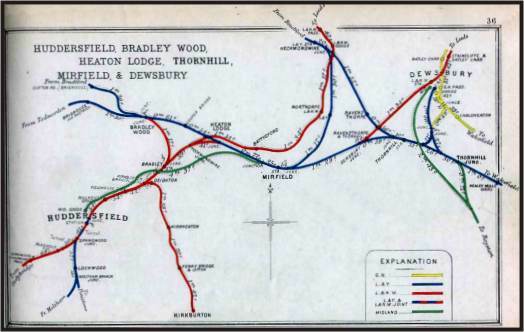 Click HERE for more about Mirfield railways.